If your home or business in South Florida has recently been damaged and you need to file an insurance claim, Stellar Public Adjusting Services is here to assist and direct you throughout the entire process so that you can get what you deserve from your insurance claim settlement. We represent you by making sure that your claim is properly assessed and documented in order to get you the compensation you rightfully deserve so that you can restore your loss and repair your damages. Call us immediately for any recent property damage to your home or business. We will guide you through how to properly mitigate the loss and proceed with filing your insurance claim. And in the event of an emergency, an experienced public adjuster from our team can be at your property for evaluation of your loss within minutes. What if my case is closed? – You think you were entitled to more money under the terms of the insurance policy, for example, you were reimbursed at actual cost value when you should have been reimbursed at replacement cost. – Your insurance claim was denied and you think you are entitled to money. If you feel like you did not get the settlement you deserve, contact us immediately. Our team of experts includes public adjusters, attorneys, contractors, mediators and engineers. We have gathered the best professionals to provide the top insurance claim representation. 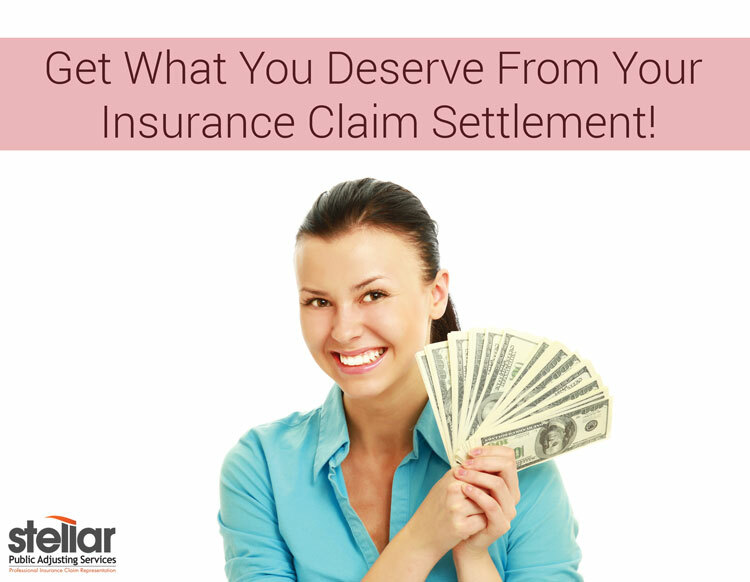 How can you get what you deserve from your insurance claim settlement in Miami? Insurance is designed to provide property owners with reimbursement for all damages under your policy. This can include minor incidents or major disasters, such as a hurricane that rips the roof off your home or a fire that destroys your house and everything in it. However, insurance is not designed to provide reimbursement for everyday maintenance problems. With this in mind, the Insurance Information Institute suggests that you document your claim well in order to get assistance if you need it. This includes reporting any burglary or theft to the police, keeping good records and filling out all claim forms correctly and promptly. Stellar Public Adjusting Services is here to help you file and document your claim in order to get you the compensation you deserve. We have assisted thousands of property owners, business owners and condominium associations in South Florida with negotiating their insurance claim settlements. No claim is too big or too small; whether your property was severely damaged by a hurricane, water damage from a pipe leak, mold, roof leaks, or whether you had a small kitchen fire, Stellar Public Adjusting Services is here to help. Our mission is to provide our clients with the very best professional insurance adjusting, loss consulting and appraisal services. Call Stellar Public Adjusting Services at (305) 570-3519 if you want to get what you deserve from your insurance claim settlement. We will make sure that you receive everything you are entitled to under your policy!